Police Diver Marty Coin has entered Boston Harbor looking for a body. But when he enters the murky brown depths, he finds something else. Confronted by his past, and looking at an unpleasant future, what will Marty do in the present? Special thanks to Ric Vinhage for editing and Liz Mierzejewski for voicework on this episode. 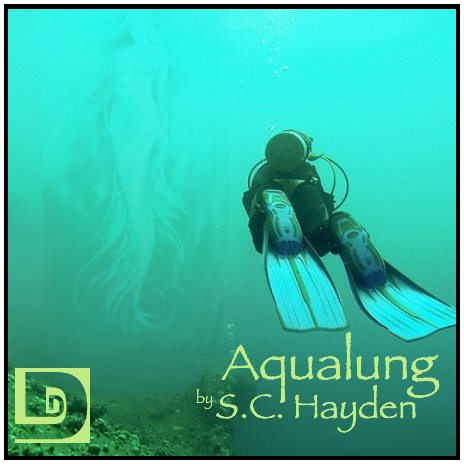 This entry was posted on April 28, 2009 at 9:11 pm and is filed under Drama, Fantasy, S.C. Hayden, Short Story. You can follow any responses to this entry through the RSS 2.0 feed. You can skip to the end and leave a response. Pinging is currently not allowed. No, I never have done undersea cave diving. I’ve never even learned to Scuba dive. There was a time when I was a teenager, and some friends and I planned a scuba diving trip. It fell through, and so I never learned. Now that I’m older, I wonder if I would be too freaked out to deal with it. I’m not sure how well honed my Mammalian Diving Reflex is. Pretty sure that’s the sexiest teacher moment I’ve ever had. You did a fantastic job Liz. Really, it was stunning. The Prestige is a good movie. For the record, I’m not a suicide advocate. I do, however, support a person’s right to self determination. We all have to die, and deciding when and on what terms, shouldn’t be beyond the realm of consideration. Anyway, The Green Mile, is another good “suicide” tale. This was another great story and I won’t even get into any morality decisions. Great job. Hopefully I’ll have a story on here at some point. Solid Production. The story had wonderful details. Very descriptive. This episode went pretty deep. These last few stories have been stellar. This one in particular. Your banter is also well enjoyed. I could listen to you two (three or four sometimes) for two hours even. I agree with PoorBrenton. You guys are becoming the Click and Clack of Podcast Fiction. There is another “Sean” posting here, so I’ll start posting as “SCH” to avoid confusion. Thank you, everyone, for the positive feed back. I’m very happy with the production. Everything was great; voices, sound effects, music, art work; everything. Luckily, there’s no other Big Ankleviches posting here. But I just wanted to echo SCH (Sean…uh C. Hayden)’s thanks to everybody for the positive feedback. To SCH as well. I’m really glad that you liked what we did with your story. Kev, the big difference between Click and Clack, and us, is that there are a lot of people listening to their show. We got John Smith, and the people who posted comments on here. But you know what…that’s enough for me. If only one person listens then we’ve done our job, and brightened (or more likely darkened) that one person’s day.